Importing the romance and charm of the streets of Venice to the Las Vegas Boulevard is the Venetian Resort Hotel Casino. With a variety of European-styled features, this high-end luxury hotel boasts an all-suite stay and a world-class experience. Guests of the Venetian will enjoy features like the Gondola Rides through the Grand Canal, authentic street entertainers, and Italian replicas like the St Mark's Campanile tower, making the Venetian Resort Hotel Casino feel like a one-way ticket from the Las Vegas Strip directly to the streets of Venice. 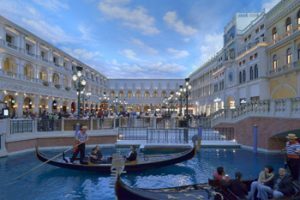 Connecting with the Palazzo Hotel & Casino Resort, the Venetian Resort continues its legacy through the halls of Italy with pedestrian-friendly pathways over authentic cobblestone, to and from the adjoined European-inspired properties. Inside these walls holds the Grand Canal Shoppes, featuring well-branded, high-end stores such as Barneys New York, Burberry, Godiva Chocolatier, Michael Kors, and Swarovski, to name a few. While dining at the Venetian, try the unique flavors of SUSHISAMBA, blending Brazilian, Peruvian, and Japanese cuisine all into one colorful menu. Also experience the Public House, which is a favorite pub-style gourmet restaurant where the extensive beer selection can be professionally-paired with any of their fine burgers and American-style fare. In the spirit of an authentic European visit, one must make a stop at the internationally-renowned wax museum: Madame Tussauds. For more entertainment options, check out a resident show at the Venetian Resort, like the Rock of Ages, Human Nature, and Priscilla Queen of the Desert. The Venetian features special shows as well with regular guests like David Spade, Joan Rivers, Rita Rudner, and Tim Allen. While at the Venetian Resort in Las Vegas, one cannot help but be transported to the romantic streets of Venice. From the singing gondolas to the cobblestone walkways, the Venetian Resort Hotel adds distinction to the Las Vegas Strip, second only to the streets of Venice itself. 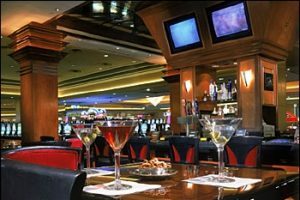 Continuing to make a name for itself, the TAO group has created a series of wildly popular and well-known restaurants and nightclubs at the Venetian Resort in Las Vegas. Featuring the TAO Nightclub & TAO Beach Club, the TAO name goes a long way in the Las Vegas party and dining scene, attracting world-class DJs and a celebrity guest list. Earning its spot as a contemporary Las Vegas iconic experience, Tao Beach at the Venetian is a day club that has become classic to the Las Vegas daytime party scene. Born from the well-known Tao Nightclub, this beach party contributes to the entire Tao experience at the Venetian Hotel & Casino in Las Vegas. For those who prefer to avoid tan lines, Tao Beach allows European sunbathing (Monday -Wednesday) and welcomes locals, who are always free. Served poolside, enjoy food from the Tao Asian Bistro, along with bars featuring fresh, exotic Tao cocktails.